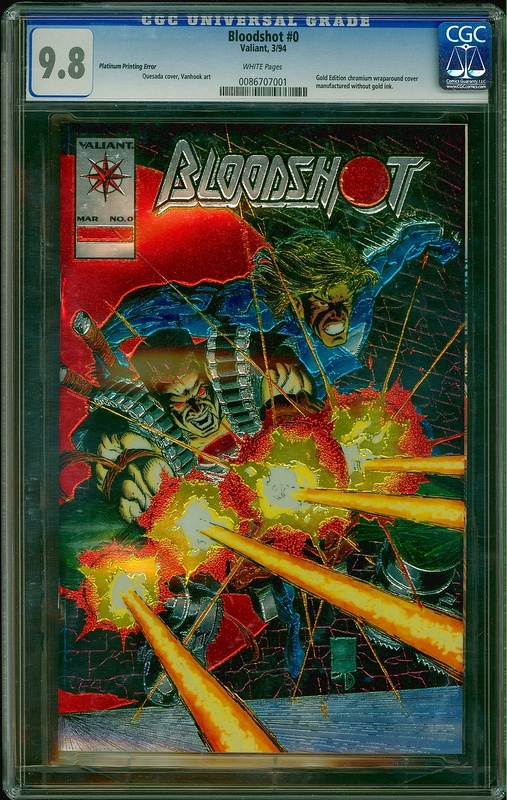 Printed in 1994, found by Pete Hunter in 2001, graded by CGC in 2003, this is the first identified copy of the Bloodshot #0 Platinum cover comic book. 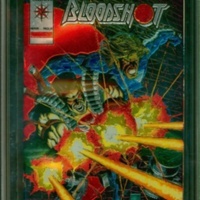 Not an officially released Valiant comic, it is believed that the printing or marketing team tested the platinum logo and price box (no price shown) during the printing of the official Bloodshot #0 Gold editions. The method of distribution is unknown. This copy was located with a group of 10 copies of Bloodshot #0 Gold edition received by a retailer in 1994. In the first 20 years following 1994, fewer than two dozen copies were known to exist. Owned by Pete Hunter, 2001-2017. Added to the Private Collection of Greg Holland in February 2017. Joe Quesada cover artist, Kevin VanHook writer, “Bloodshot #0 Platinum (first known copy),” The Valiant Museum, accessed April 25, 2019, http://valiantmuseum.com/archive/items/show/42.